What does a "supported" running tour mean? On an Adventure Running Co. supported tour, all of your camping and personal gear as well as food provisions, cooking equipment and community gear (kitchen shelter, folding chairs, etc.) are carried for you to the next day’s camp. On lodge to lodge or Inn based tours we carry all of your personal gear to the next night’s lodging where all check-in and other details are already taken care of. What is your responsibility on a supported tour like this? You are responsible for enjoying yourself while running with a very light pack on a spectacular running trail and then relaxing when the day is done! You may be asked to help set up your own personal tent and get your personal gear out of the support vehicle, but after that you can come to the community area to relax, clean up, enjoy some tasty snacks and then eat your evening meal that has already been planned and prepared for you. On lodge to lodge tours you’ll be able to go directly to your room to clean up and relax before an early evening meal at a local restaurant. Most of our tours utilize trails that offer running from point-to-point progressively each day so you’ll feel like you’re on a journey. You may run the length of the North Dakota badlands on the Maah Daah Hey Trail following in the footsteps of Teddy Roosevelt or completely circle Cloud Peak in the Bighorn Mountains on the Solitude Trail. On an Adventure Running Co. tour, you’ll feel like you’re really getting somewhere! "Adventure Running Co. was organized. They did their homework!" Will I have to carry anything with me? Yes, you’ll have to carry a light pack with water, lunch, rain gear and some other light safety items each day. In some cases, we may have to filter water during the day. Our guides will carry water filters on the trail, but you may want to bring your own as well to ensure that you have a water filter right when you might need it. You'll also want to be sure to have a hydration pack or water bottles that can carry enough water for the longer days on the tour. Be sure to test out your hydration system prior to your tour to see how much water you need and how long your water will last. Our guides will carry additional safety items and wilderness first aid kits in case of emergency. But, all of the heavy loads will be taken care of for you! Will I see support vehicles while I’m running? On some of our tours, you won’t have access to support vehicles during the day while you're running due to the remote wilderness nature of the trails we’ll be traveling. However, where access is possible support vehicles may be utilized during our runs and will provide opportunities for refreshments, aid and a ride if you’re getting tired. How long are the trail runs each day? The length of our daily running adventures varies from trip to trip. Some of our trips, due primarily to the nature of trail access in a particular area, have longer days and may require previous long distance running experience while other trips include more short distance days. On most of our trips, we try to include at least one short distance or rest day within the common 4 to 5 day running adventure. Most of our trips include at least one day of close to 20 miles or more as well. For the most part, a reasonably fit individual can, without too much trouble, hike 20 miles in a day. While we are often running in rugged mountainous terrain on our adventures, you should be able to cover the distance required each day fairly easily. Also remember, these adventures are not races. Take your time each day, enjoy the view, dip your feet in a mountain stream, lay down in a meadow and soak up the sun, jump in a lake for a swim if you want. The point of our adventures is to enjoy the journey. When you arrive at camp or at an Inn or cabin that evening, everything will be set up and snacks will be waiting while dinner is being prepared or reservations are made at a restaurant. While some days may be long, you’ll have a relaxing evening to recharge for the next day! Do I have to run every day? No. If you’re not up for a run one day, you may take the day off and enjoy a laid-back day or take a shorter run from that evenings camp or lodging facility at your leisure. Since we move to another site every day, you can ride in one of the support vehicles to the next days lodging or camp. Some tours will also include shorter options on our longer days if access is available. In addition, you may bring along your non-running spouse or significant other. If tour participants are not running that day, they may ride along in the support vehicle to the next camp or lodging facility and go for day hikes or short runs from that location. However, because your spouse or significant other will be taking a spot that another participant might have been able to use, they will be charged the full tour fee to participate. a trip for us to remember!" Do I need trail running experience? While trail running experience will certainly be helpful, it isn’t required. While many of the trails we run on are quite rugged with tricky footing in many places, a seasoned runner or hiker will be able to complete each day’s run. On most tours, a strong hiker should be able to complete each days segment easily, so if you need to slow down to negotiate a tricky spot, go ahead! That said, we do recommend that you practice trail running prior to the trip if you haven’t done so before. Having some experience running on terrain similar to what we’ll encounter on one of our tours will be very helpful and allow you to get even more enjoyment out of your tour. On an Advanced tour like the Wonderland Trail tour, previous trail running experience is essentially required. You should also have experience running long distances over rough terrain with significant elevation change. Is an Adventure Running Co. tour like a trail running training camp? Adventure Running Co. is not a training camp. However, our guides are experienced trail and ultramarathon runners and will certainly be imparting their combined wisdom to our guests. 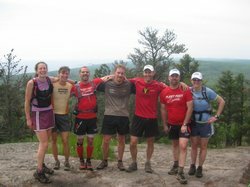 If you’re new to trail running, you’re sure to learn something on one of our trips, and if you’re already an experienced trail runner, you’ll most likely still learn something, plus you’ll get in some sweet training, run some spectacular trails and meet some great people! Depending on your tour choice, we’ll be camping well or staying in comfortable lodging facilities. On our lodge to lodge tours, we choose charming lodges, inns or cabins that reflect the local flavor of the area. We try to find local restaurants that serve cuisine unique to the area we’re traveling in and include a variety of dining options. On our camping tours, you can expect scenic campgrounds or peaceful campsites with cozy campfires and star-filled skies. Most of our camping tours utilize public campgrounds which provide public toilet facilities, running water and sometimes showers. You’ll need to provide your own tent, sleeping bag and sleeping pad. If you don’t have these items, rentals are available for a small fee. While our camping tours might include sleeping outdoors in a tent, you won’t really be "roughing" it. Each campsite will have a covered canopy for cooking and eating and hanging out if the weather is bad. All meals are included and will be prepared for you while you clean up after your run and at the beginning of the day. How can I clean up each day after running? If we’re staying in a lodging facility, showers will be available in your room or cabin each day. On our camping tours, some campgrounds may have shower facilities. When public shower facilities aren’t available, we may provide private shower facilities. A private stall away from the main camp area will be set up to clean up in when time permits. In many cases on our camping tours, we will utilize streams, rivers and lakes to cool off and clean up in after a day of running. When our campsite has running water, you can also utilize the wash basins and water spigots. You should also carry your own supplies such as wet wipes and washclothes if you come in late and a shower, creek or water spigot option isn't available. "The variety of meals was excellent. The special attention to fresh fruit and vegetables was awesome! You guys went overboard on taking good care of us!" Great! By the end of the week you’ll have made new friends. Sharing a trail with other runners in beautiful places is one of the reasons we started these adventure running tours. If you’re traveling alone and you’re willing to share a room on our lodge based tours, a single supplement won’t be charged. If you’d like your own room on one of these tours, single supplements are available on nearly every tour. This is an extra charge over the quoted double room rate which is part of your tour fee. You will be booked into a double unless you indicate in advance your single preference. Please notify us of this preference as early as possible so we can make arrangements. On our camping tours, this isn’t an issue. If you’re traveling alone, just bring your own tent to sleep in. What kind of gear do I need to bring? Primarily, you’ll need some clothes, rain gear, broken in running shoes, sleeping bag, sleeping pad, tent and a comfortable running pack. Once you sign up, we’ll send you a packing list detailing the clothing, gear, and toiletries to pack. Be sure to pack carefully. While we want to make sure you bring all of the items you might need, cargo space on our tours is limited. We will provide runners with an 8,000 cubic inch dry bag for you to put all of your gear and clothes in. Please make sure your gear does not exceed this amount. On our camping tours, all food is prepared for you starting with lunch on the first day through lunch on the last day. On lodge to lodge tours, lunches will be prepared each day. Most dinners and breakfasts will be at local restaurants. All meals are freshly prepared and you can expect fresh vegetables and fruit. If you have special diet requirements, we can accommodate with prior notice. Vegan and vegetarian meals will be available. A word about our lunches on the trail. Trail lunches will be provided, but with running, many of you may have specific items that you like for mid run snacks that we may not be able to provide. Please bring along those personal food choices as we won’t be able to provide every possible item for your lunches. We'll provide a variety of options for your lunches, but we won't be able to provide everything. "Support/guides were great, meals were excellent, the other runners were fun to be with, on the trail and in camp - there was no downside to any aspect of the run." How big will the groups be? Groups are relatively small - generally between 6 and 12 participants. On some tours backcountry and wilderness travel requirements may limit the size of the group. It’s especially important on these tours to sign up early to reserve your spot. All internal expenses and services are included in the tour price. Basically, from the time you get to the meeting point until we bring you back, all transportation, food preparation, meals, snacks, non-alcoholic beverages, group kitchen, and group gear is included. All pre-trip documentation, backcountry permits, licenses, park fees, camping fees, reservations and accommodations are also included, along with tour leaders, guides, travel area maps, communication devices, water filtration if necessary, first aid gear and vehicle support. We recommend that you bring your own sleeping gear (tent, sleeping bag, pad), but if necessary, you may rent these items from us. You’ll be responsible for transportation to and from the meeting location and personal items. How hard will these tours be? If you’re an active trail runner you shouldn’t have any problem with our tours. But, be sure you’re prepared for some serious trail running. The more prepared you are for a tour, the more fun you’ll have and the further you’ll be able to go. The trip will also be safer for both you and our other participants. You will benefit greatly from prior conditioning and experience. Our tours are designated with general levels indicating how difficult they are. Advanced tours generally include longer days, rougher, rockier, trickier trail, steeper and longer climbs and descents, altitude, possibly more challenging route finding, potential weather challenges and more remote locations without access to support vehicles. Intermediate tours generally include shorter days with at least one short day or rest day, smoother trail, less elevation change, lower altitude and possibly access to support vehicles. Due to the vagaries of trail running in spectacular locations, there really aren’t any "easy" trips that would include the kinds of rewards most trail runners seek. If demand is great enough though, we’ll seek out trails to include in an "easy" adventure running tour. Many of our tours may be a mix of the aforementioned descriptions of advanced and intermediate levels. While our levels of difficulty are general, we’ll do our best to describe the trip so you can make an informed choice. Contact us if you have any questions about the difficulty of a particular tour. "Adventure Running provided access to a unique trail in a unique environment. They did it with enthusiasm, graciously and with good provisions. Wonderful hosts who cared about and provided well for their guests." When you decide on your Adventure Running Co. tour, go to our Reservations page to register online. You may reserve your spot on the tour with a $500 credit card deposit made through our secure Paypal based site. The balance of your tour fee is due at least 60 days before the start date of your tour. You can also call us or e-mail us to confirm your choice and reserve your spot. If Adventure Running Co. must cancel a tour for whatever reason you will receive a full refund of your tour payments. In order to cover the many expenses Adventure Running Co. cannot recover if you cancel, and provide proper notice to our lodging partners, we cannot provide a full refund of your tour payments if you choose to cancel for whatever reason. After our refund deadline has passed, we cannot provide a refund for any reason including circumstances beyond your control such as weather-related travel delays, family emergency or injury. There is no partial refund if you arrive late to your tour or depart early. Trip cancellation charges aren’t meant to be punitive, they just reflect the expenses Adventure Running Co. has incurred in administering your reservation and planning for your participation. We strongly recommend trip cancellation/trip interruption insurance, which will cover your cost if you need to cancel or interrupt your tour. As mentioned before, we strongly recommend trip cancellation/trip interruption insurance. We honestly wouldn’t recommend this if it wasn't a real benefit to you. For example, a quick quote from AIG Travelguard Insurance (quote made on 5/27/08) revealed a travel insurance package that provides basic coverage for trip cancellation, interruption and delay, emergency medical treatment or evacuation, lost, stolen or damaged baggage or personal effects, baggage delay and emergency medical assistance priced at $37 (price subject to change based on date of travel, travel location, state of residency and trip cost) for one person.